Once your feed has been added, you will want to add your iTunes tags to ensure your RSS feed is 100% compatible and optimized for submission to iTunes (the largest podcast directory). FeedPress supports all of the tags you need to make a compatible iTunes feed. 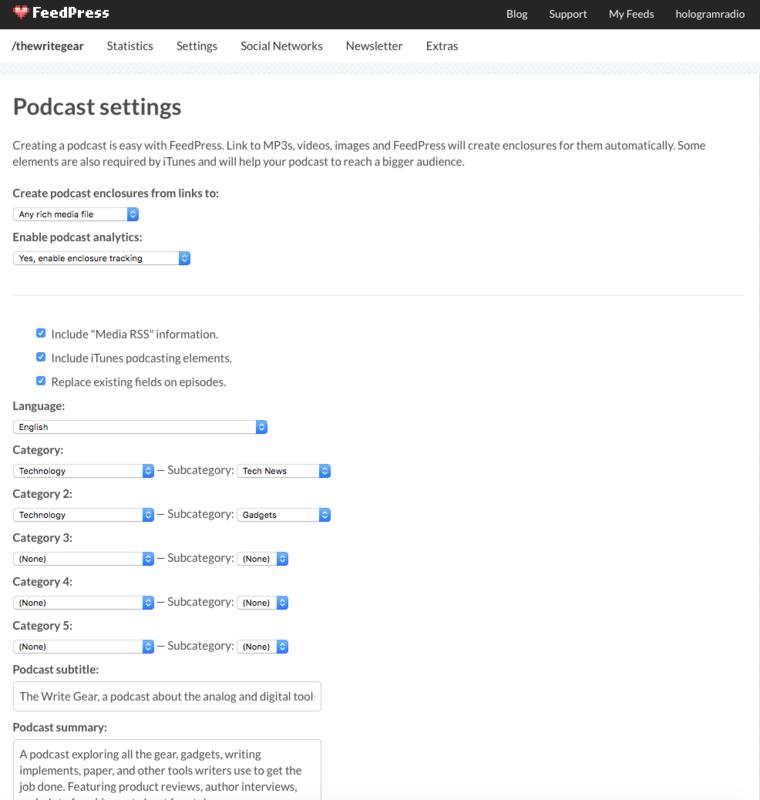 In your feed dashboard, click on Settings > Your Podcast. Fill in all of the available fields, such as podcast subtitle, summary, search tags, email address, copyright, etc. You should now have a compatible iTunes podcast feed. 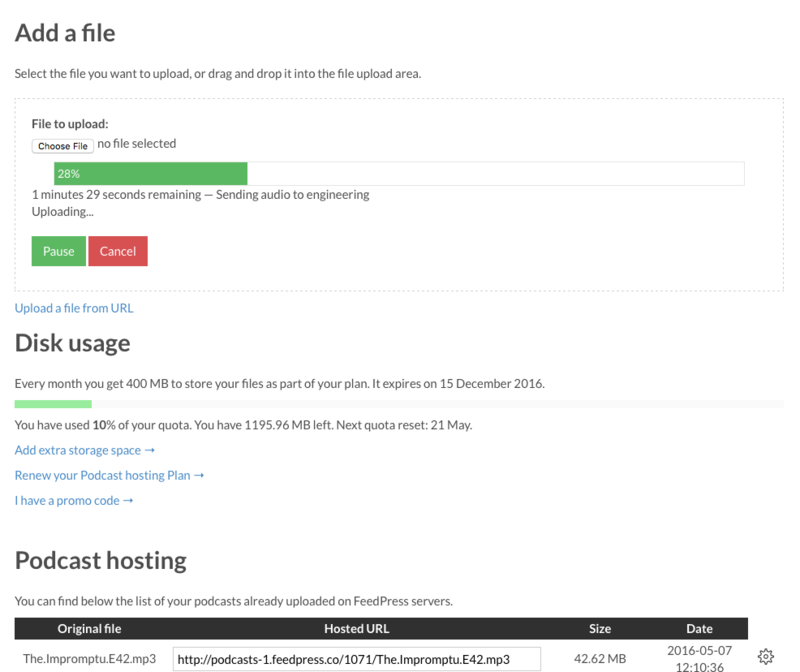 The next step is uploading your podcast files to FeedPress (if you’re using us for hosting). If you’re hosting your media with a third party service, you can skip this step. We have a separate article explaining podcast hosting, [which you can view here](https://feed.press/support/tutorials/uploading-your-podcast-files). We outline the steps in this tutorial as well. In your feed dashboard, click on Settings > Your Files. Drag and drop a supported audio file (MP3, M4A) into the upload area, or use the old fashioned browse button to select the file. 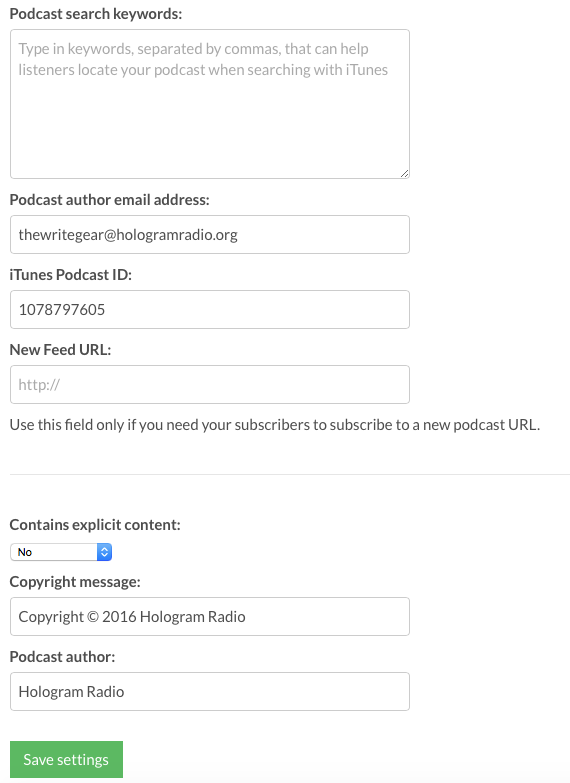 Copy the URL provided after the upload completes and include it in the post for the podcast you publish. On your feed dashboard, you will see your FeedPress RSS feed URL. This is what you can use to submit to iTunes or other podcast directories. If you would like your own branded URL using your personal domain name, please configure your Custom Hostname. You may now head over to Apple’s Podcast Connect dashboard. Login with your Apple ID to submit your podcast. Important note: You MUST have at least one episode available in your feed, otherwise Apple will reject your podcast. In Podcast Connect, click the + icon to add your feed. In the screenshot below, you can see in this case I’m using an RSS feed which I configured using my own domain name, via the Custom Hostname feature FeedPress provides. Click Validate and submit the podcast. Congratulations, you’re done! Now it’s only a matter of waiting for Apple to approve your podcast.